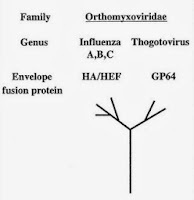 Het Thogoto Virus belongs to the Thogotoviruses and that makes it a direct relative of the influenza viruses because all are part of the larger family of Orthomyxoviruses. 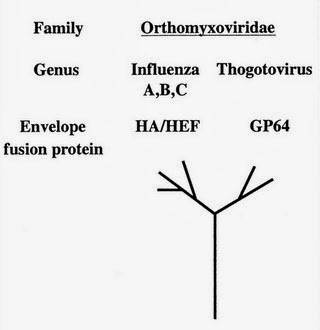 The genus Togotoviruses has eight distinct members: Thogoto Virus, Dhori Virus, Araguari Virus, Batken Virus, Jos Virus, Upolu Virus, Aransas Bay Virus, Bourbon Virus and Sinu Virus. 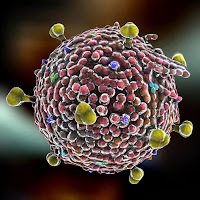 Thogoto Virus is also known as Influenza D, but that designation can create some confusion because the synonym Influenza D is also sporadically used for Human Parainfluenza Virus type 1 (HPIV-1). The Thogoto Virus was first discovered in ticks in 1965 in Kenya. Ticks are a known vector for all sorts of disease causing agents, such as viruses, bacteria, parasites, etc. Somewhat later it was discovered that cattle could be infected with the Thogoto Virus. Sheep are also at risk. Then the hunt was on to see if the Thogoto Virus had the potential to cause pandemics. Did it have antigenic drift? Were antigenic shifts a possibility? Researchers compared virus isolates from Portugal, Italy, Nigeria, Central African Republic, Cameroon and Iran. Considering the broad geographic distribution of these strains, the antigenic differences seen appear to be essentially minor. This uniformity suggests that the distribution of Thogoto Virus is due to repeated introduction of virus from common sources and that such introduction may depend on the movement of tick-infested domestic animals. This means that ticks infected livestock and then infected livestock infected the ticks. No environmental pressures were present to force the virus into changing its appearance. That is good news, you might comment, but all is not well because even humans can become infected with the Thogoto Virus, causing a fever and encephalitis. And that suggests that we might become a mixing vessel for all sorts of existing viruses. At which point a new subtype of Thogoto Virus might eventually appear.